Security has been stepped up at homes of Japanese officials after two people linked to the health ministry were killed and a third was knifed. 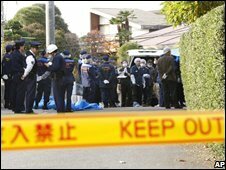 A former vice-minister of health and his wife were found stabbed to death in Saitama, near Tokyo, on Tuesday. Hours later, the wife of another former official was stabbed in the capital by a man disguised as a delivery worker. Both officials had resigned for their part in a scandal involving the loss of millions of pension records. In 2007, ministers admitted roughly 50 million people would have to check whether or not their pension records were accurate after official records were mislaid. The scandal provoked widespread anger in Japan and, was partly responsible for the ruling party's defeat in elections last year, correspondents say. Takehiko Yamaguchi, 66, and his 61-year-old wife, Michiko, were found dead at their home in Saitama, 40km (25 miles) north-west of the capital, police said. Both had several stab wounds to their chests, police said. Later on Tuesday, the 72-year-old wife of Kenji Yoshihara, another former vice-minister of health, was attacked at their Tokyo home. Yasuko Yoshihara was stabbed several times in the chest when she opened the door to a man she thought was delivering a parcel, Japanese media reported, but her injuries were not thought to be life-threatening. Mr Yoshihara was not at home at the time of the attack, reports said. 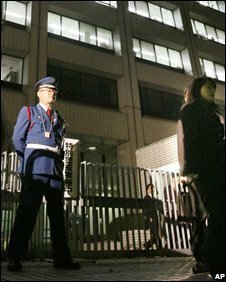 Kyodo news agency said police had stepped up security nationwide, amid fears of serial attacks against Japanese bureaucrats. Both officials had been involved in developing Japan's much-criticised current basic pension system.